Since 1999, instructors have been using SIMnet to measure student outcomes in a virtual Microsoft® Office environment. Now completely online, with nothing to install, students can practice and study their skills at home or in the school lab. Moreover, this resource is an ideal course solution but even more valuable as it can be used beyond the course for self-study! At McGraw-Hill, we help your students become life-long learners! SIMnet is McGraw-Hill Education’s leading solution for learning and assessment of Microsoft Office skills and beyond! 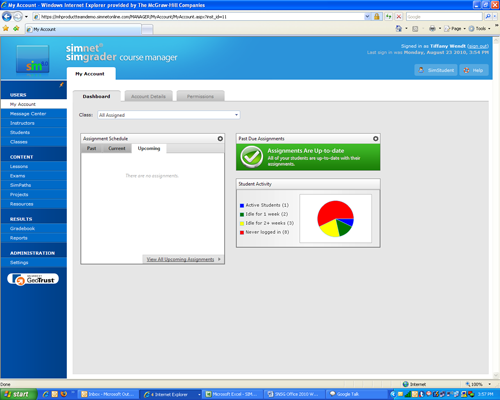 SIMnet is accessible for today’s students through multiple browsers and is easy to use for all! SIMnet offers various SIMbooks, projects and assignments for students to go MOBILE for their student learning and student assessment. SIMnet offers lifelong learning! SIMnet is designed with a Student Library feature to help students immediately learn isolated Microsoft Office skills on demand. Students can retrieve instructional content both in and beyond the course. It’s more than a resource; it’s a tool they can use throughout their entire time at your institution and in the workplace. SIMnet provides powerful, measurable results for you and your students! See results immediately in our various reports and customizable gradebook. SIMnet is your solution for helping students master today’s Microsoft Office Skills and more. SIMnet for Office 2016 …Keep IT SIMple! To learn more, contact your McGraw-Hill representative. Combine multiple applications into one exam. Perfect for mid-terms or finals! Assign lessons and exams to classes or to students. Preview exams, lessons, questions, and tasks directly from the Course Manager. Over 200 possible reports. Many with detailed charts and statistical analysis. Flexible filters to copy questions correlated to McGraw-Hill textbook chapters. More than 10,000 objective based questions. Create exams that fit your needs with random question order including random question subsets so every exam is unique. Allow multiple exam and question attempts. Specify time limits and due-dates. Protect exams by IP address and/or password. Customizable and editable gradebook available. To receive an evaluation login to SIMnet Online, please contact your McGraw-Hill representative today!